HostEasier Review 2019: Is HostEasier a Good Hosting? HostEasier is a no-frills discount web hosting service that’s perfect for small businesses and startups looking to get quality web hosting. Their VPS and reseller hosting packages come with 30-day money back guarantees. Established in 2004, HostEasier is an American web hosting company based out of offices in Illinois. They don’t provide specific details on the number of websites they host, but the number of industry awards they’ve accumulated stands as a testament to the many webmasters benefiting from their extremely low-cost services. HostEasier has one of the most basic ranges of web hosting plans available. While generally beginner-friendly, their plans do sacrifice a bit in the area of speed and performance. While their inclusion of the RVsitebuilder tool on top of Softaculous was a nice touch, you’ll notice that they only offer a 99.5% uptime guarantee and support for up to PHP 5. This potentially means significantly more downtime than the industry norm and half the PHP script processing speeds than if they offered support for PHP 7 at minimum. On the upside, they do offer shared SSL certificates with the option of purchasing more premium certificates in addition to a dedicated IP address. They also support more advanced scripting languages such as Python and Ruby on Rails, though strangely enough they still support the rather outdated Microsoft FrontPage extensions. HostEasier offers some of the cheapest web hosting prices you will find on the internet. Their shared hosting plans are cheaper than similar offerings from almost any other competitor. In addition, their entry-level VPS plans are on par with those of their competitors, while their higher-end plans provide equal increases in price and functionality. Moreover, discounts are available if you purchase an annual package. Overall, HostEasier’s price list is geared towards smaller businesses and new companies looking to get good web hosting for very little cost. It does sacrifice a little in terms of speed and uptime, but most beginning webmasters will find that HostEasier’s plans are adequate for their needs. For larger companies, the dedicated server plans provide a surprising amount of value for a company with such a strong emphasis on keeping costs down. While the HDD storage is definitely a performance compromise from the SSD you’ll find elsewhere to handle large volumes of data, the 32GB of RAM and 2×1000 GB drives still provide a lot of power for a reasonable price. You also get access to all the integrations in Softaculous. One place where HostEasier falters is customer support. Live chat in English is offered as an option, but I was unable to connect to it from multiple browsers. There’s also no phone number to call. Email is the only option and it took several days to get a response. 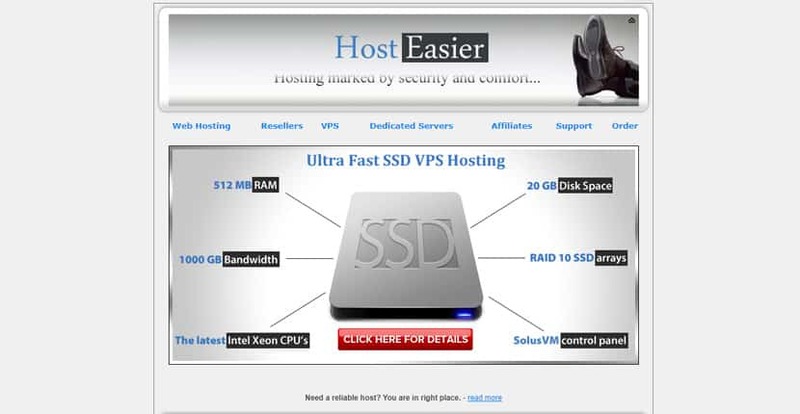 HostEasier is one of the cheapest web hosting options you’ll find. For small businesses willing to forgo some speed and uptime, it’s an excellent way to get a lot of power without spending a lot of money. Wondering how HostEasier stacks up against other Web Hosting companies? Enter any other Web Hosting company and we will give you a side-by-side comparison.